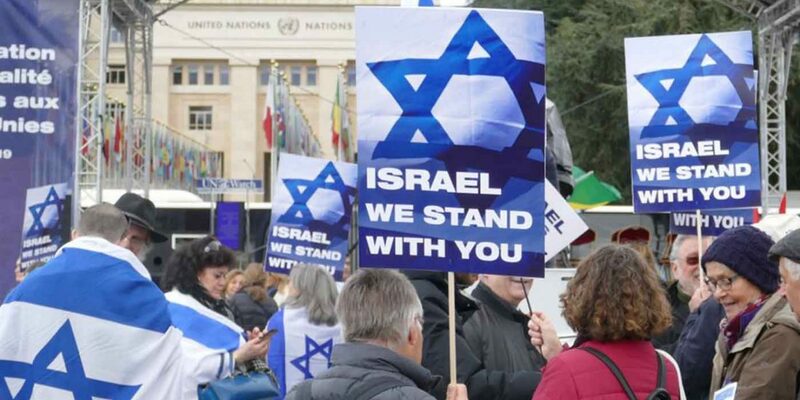 Hundreds of pro-Israel supporters from all across Europe took part in a protest outside the United Nations headquarters in Geneva on Monday. The demonstrations took place outside as the United Nations Human Rights Council discussed its infamous agenda item 7. The definition of anti-Semitism (Jew-hatred) explains that criticism of Israel (the world’s only Jewish state) is anti-Semitic in nature when Israel is treated differently to or held to a higher standard than the rest of the world. The notorious “Agenda Item 7” is a permanent fixture at every UNHRC session. The only country mentioned in it is Israel. In fact, no other country in the world receives its own agenda item. The rest of the countries share a combined agenda item. Israel is singled out and treated differently to every other nation. This is anti-Semitic. A further insult is that the countries who accuse Israel of so-called “human rights abuses” are themselves some of the worst human rights abusers on the planet. They are given free rein to spout their anti-Semitic rhetoric over a number of days. It is the height of hypocrisy and one of the many reasons why the United Nations is no longer the moral compass it claims to be. Neuer said. “The only country in the world that is the focus of its own day, its own debate, its own agenda item. Not North Korea, not Syria, not Sudan is treated in this way.” He noted that some accused the Jewish state of war crimes while giving a free pass to Hamas, the ad hoc authority in Gaza. CUFI’s Kasim Hafeez was also in Geneva and had the opportunity to speak at the UNHRC; calling out their anti-Israel hatred. Fortunately, more nations are now coming against this bias and standing up for Israel. This year Denmark and Australia added their names to the list of countries who were not impressed with this practice. “As a member, Denmark will work for a council that treats all states in an equal and fair manner. It undermines the credibility of this council and its members when it insists on singling out one country, Israel, a democracy, under its own agenda item ,” Danish Foreign Minister Anders Samuelsen said. Samuelsen directly called on all of the 47 UNHRC member states to stay silent during the Item 7 debate. “All countries should be treated on an equal footing. Therefore, we will not speak under Item 7, but address the situation in Israel/Palestine under other country-specific items [Agenda Item 4] where it belongs. We encourage others to do the same,” Samuelsen said. Middle East Minister, Alistair Burt, has said that Britain is expected to oppose anti-Israel resolutions at the UNHRC on Friday. The comments came in response to a question by Conservative MP, Zac Goldsmith, who also raised the problem of violence by Hamas security forces trying to stop protests against the regime. At the UNHRC 40th session that started on Monday, Israel was again singled out in the notorious “Agenda Item 7” – a permanent fixture at every UNHRC session, with no other country in the world receiving its own agenda item. In June last year, Britain warned the UNHRC that the UK will vote against all anti-Israel resolutions unless it stopped its anti-Israel bias by the end of 2018. More than six months have now passed, however the UNHRC has clearly not changed its anti-Israel bias. Over 2,000 CUFI supporters have written to Foreign Secretary calling upon Britain to keep its word and make an important stand against hatred for Israel at the United Nations. CUFI believes the UK should honour its word by voting against all anti-Israel resolutions under Item 7. Britain should demand that the UNHRC ends its bias against Israel, call for the end of Item 7 itself and, if necessary, take further action against the UNHRC’s “disproportionate” and “damaging” attitude towards Israel and towards peace.